American Airlines 707 Jet Stewardess: The first transcontinental commercial jet trip was made by an American Airlines Boeing 707, from Los Angeles to New York. The first transcontinental commercial jet trip was made by an American Airlines Boeing 707, from Los Angeles to New York. Thank you for remembering this special day in my life and a very historical moment in time which many of us celebrate and enjoy the story of Props to Jets. Yes, Sir, I have written a book about how it was for me to be an American Airline stewardess. I have not explored the American Airline archives for information for my book. My memories and my personal memorabilia have provided the background for my experience. I wrote a book to celebrate my life as a stewardess during what I considered the Golden years of flying when passengers were special guests to be served with comfort and kindness along with style for the elect whether celebrity or not. 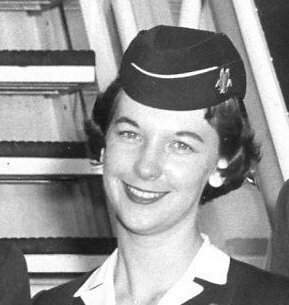 I loved to be an American Airline stewardess. My book: More Than A Ticket From Props to Jets will be self published in or by March. Do you have any suggestions about the marketing of the book? Thank you for your interest in the First Jet Flight for American Airlines that I was pleased to enjoy and well remember the excitement. Any questions: argie.ella@gmail.com I am looking forward to have you be delighted with a good read of the book. It will include five other AA stewardesses, three former pilots, and two former passengers. In my opinion the book is unique because it is for the general public and highlighted with the American values that made our country great. Enjoy and thanks for the opportunity to comment.